This September, the American Collegiate Go Association (ACGA) will be hosting a Chinese professional tournament on US soil for the first time ever, at Harvard University. While four of the strongest Chinese professionals play the semifinals of the Chang Qi Cup, the ACGA will also be holding a 4-round AGA-rated tournament for amateurs. Thanks to the Ing Foundation’s generous sponsorship, there is more than $10,000 available in cash prizes across the divisions, including a 16-player open section, and registrants will receive free catered lunches. Live commentary, pro simuls, and game reviews are also planned, and the entire event is absolutely free. Register early here for a free goodie bag, and a chance to participate in a simul against Chang Hao 9P. -Julian Erville. 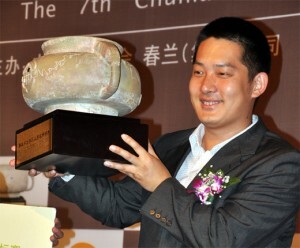 Photo: Chang Hao winning the Chunlan Cup. Uncovering the link between go and education Go is a game, a hobby, a profession. It’s a competition, it’s a communication tool and it’s a way of life. 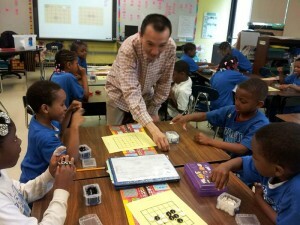 But what happens when go enters home and school as an educational tool? 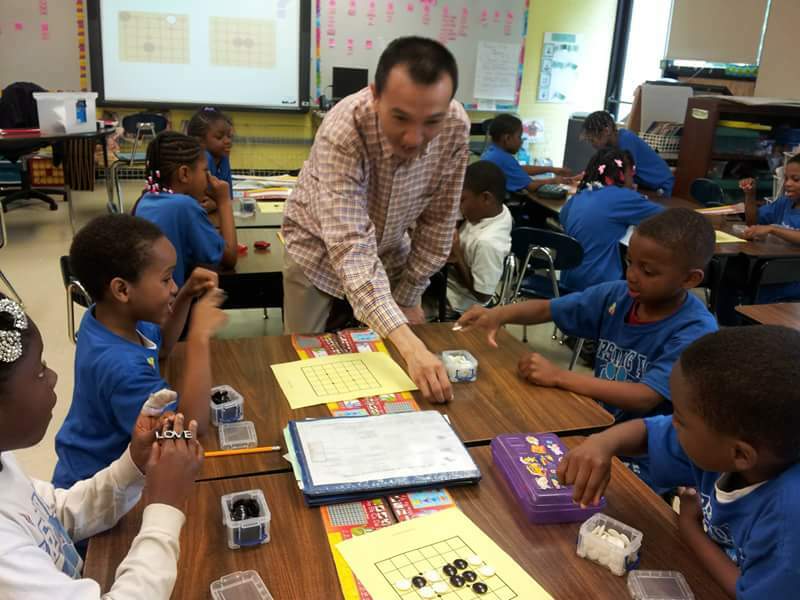 Xinming Simon Guo, founder of the Go and Math Academy in Chicago, Illinois, will explore go’s impact in his keynote remarks at this year’s US Go Congress opening ceremonies this Saturday in St. Paul, Minnesota. 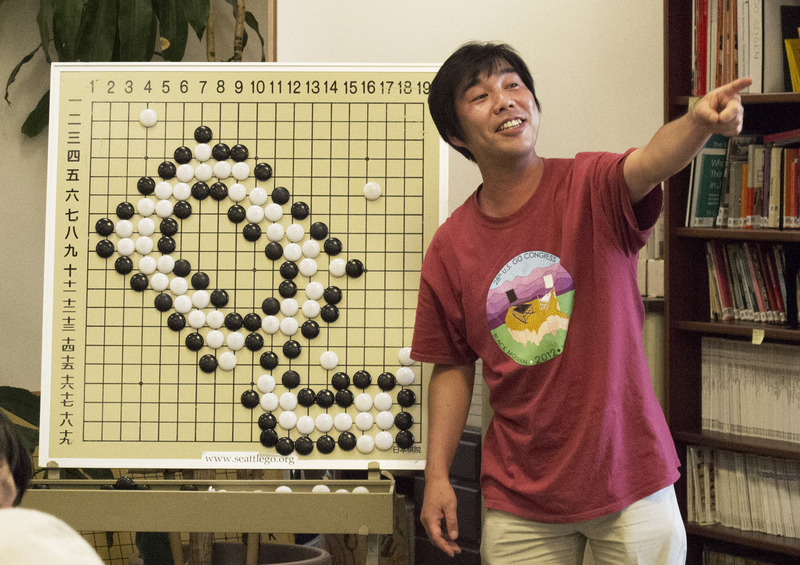 “Imagine an era in which every student has opportunities to learn math through go and fall in love with both of them,” says Guo. Alistair Wall Wins at 27th Milton Keynes Go Tournament: 35 players gathered in the sunny Open University Sports Pavilion for the 27th Milton Keynes Go Tournament on June 27. First place went to Alistair Wall 2d and second place to Ngoc-Trang (Nyoshi) Cao 2d. Ngoc-Trang Cao wins the Welsh Open: The 23rd Welsh Open was held at the Min-Y-Mor Hotel in Barmouth and organised by Martin and Helen Harvey. Over the two days, 26 players took part. Ngoc-Trang (Nyoshi) Cao 2d and Mingcan Xu 3d Cardiff finished on 5 wins, but Cao won by tiebreak. Prizes for 4 wins went to Richard Hunter 2d, Roger Huyshe 3k, and David Horan 7k. 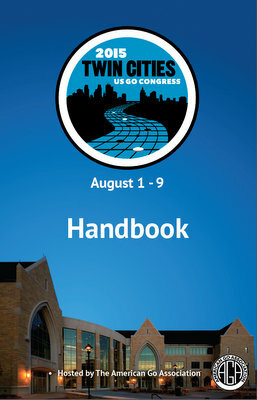 Seattle will benefit from the upcoming U.S. Go Congress in St. Paul, even though it is 1700 miles away, as visitors stop by before and after the August 1-9 event. Ryo Maeda 6P and Koyo Hoshikawa 3P from the Kansai Ki-in of Japan will visit the Seattle Go Center on Tuesday and Wednesday, July 28 and 29. They will play simultaneous games on Tuesday, and Maeda Sensei will give one of his famous lectures for kyu players on Wednesday evening. 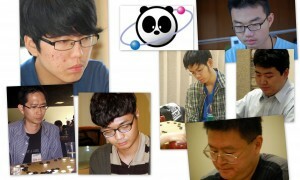 The weekend after the Go Congress, August 15 and 16, Myungwan Kim 9P will conduct a workshop for strong players. He will be assisted by Mark Lee, winner of the U.S. Open in 2014. 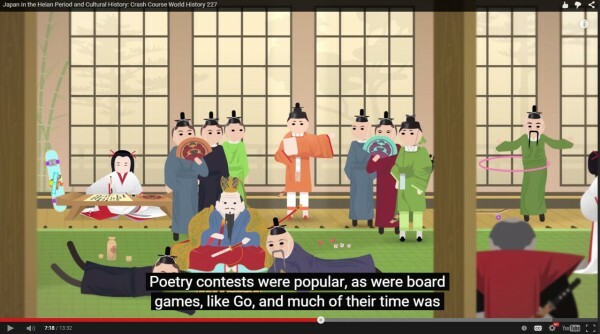 The workshop will feature simultaneous games with the two teachers, game analysis of student games, analysis of top games from the U.S. Go Congress, and lessons on the Korean style opening. The next weekend, August 22 and 23, Inseong Hwang of the on-line Go school the “American Yunguseng Dojang“, will teach a workshop for players 15 kyu and stronger. It will include games between workshop participants, game analysis and lectures. Mr. Hwang says he often explains moves both at the 6-7 kyu level and also at the 1-2 dan level, since that is where people get stuck. 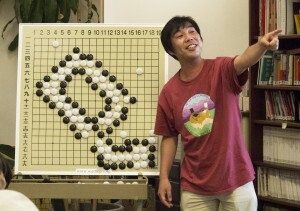 Mr. Hwang is the highest rated Go player in Europe (EGF). He will also attend the US Go Congress on his trip. 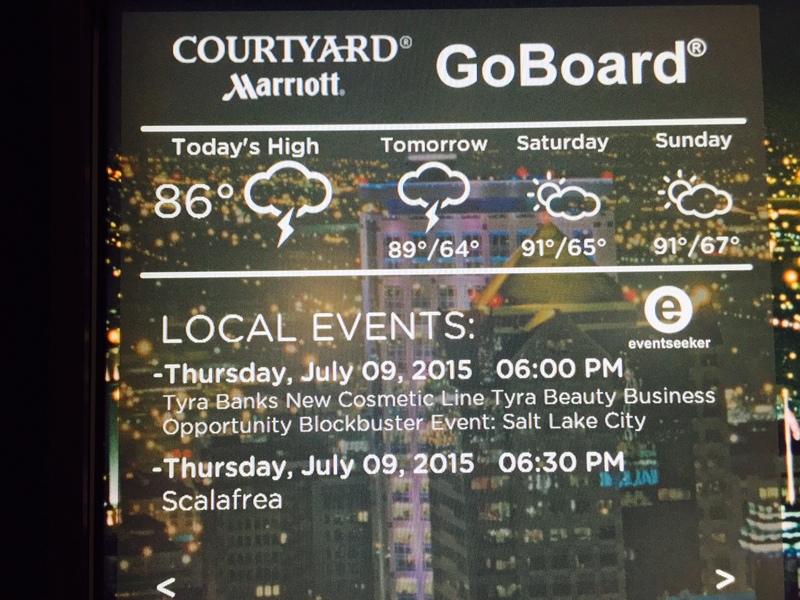 EJ photographer Phil Straus spotted this unusual go board recently at an airport Marriott in Salt Lake City, Utah. 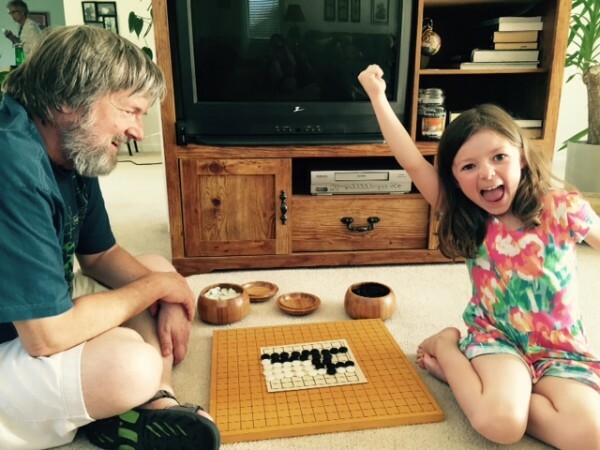 China’s News Silk Road Strategy & Go: In Weiqi Versus Chess (Huffington Post 4/3/2015), David Gosset says that “China’s New Silk Road strategy certainly integrates the importance of Eurasia but it also neutralizes the US pivot to Asia by enveloping it in a move which is broader both in space and in time: an approach inspired by the intelligence of Weiqi has outwitted the calculation of a chess player.” Thanks to reader Ted Joe for passing this along.